He came to us for a logo and some new business cards. 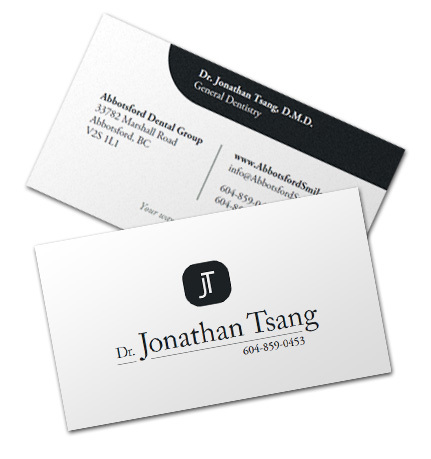 Dr. Tsang's needed a logo that was limited to grayscale. We produced a few logo concepts, and some even included teeth. He went with the top one (which was my personal favourite). Next, we got started on his business cards. We produced a few concepts, and are very happy with the final version. It's difficult to see here, but the logo on the front of the card is shiny. Recently, we also put together a custom inventory system for them built specifically for use on iPhones, an iPod touch, and iPads. It's pretty cool, and makes keeping track of when to re-order items easy.